The National Mall, as the monumental core of Washington DC, dates back to the early establishment of the City of Washington as the permanent seat of the United States government. The public space that is today known as the Mall evolved with the growth of the city and the nation. Following is a brief summary of the history and development of the National Mall. In 1791, President George Washington appointed Pierre Charles L'Enfant, a French-born American architect, and civil engineer, to design the ten-mile-square of federal territory as the nation’s capital (the District of Columbia). 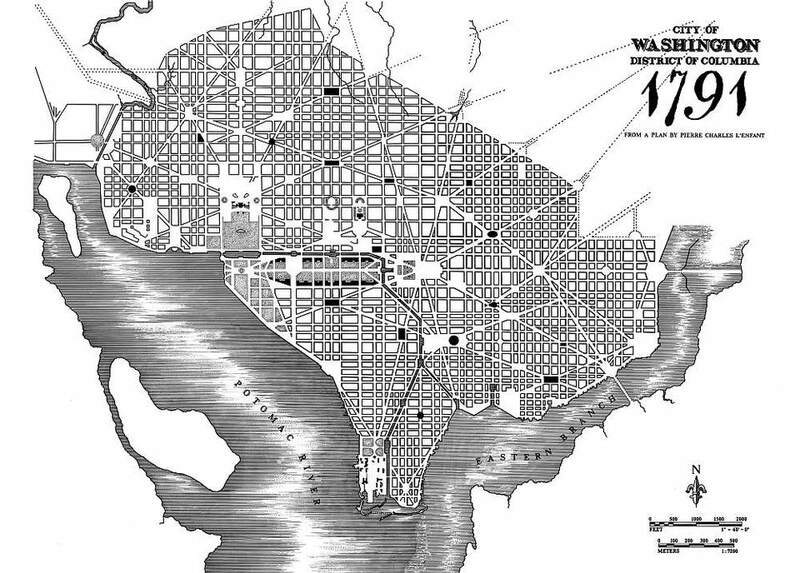 The city's streets were laid out in a grid running north-south and east-west with wider diagonal "grand avenues" crossing the grid and circles and plazas allowing for open spaces for monuments and memorials. L’Enfant envisioned a "grand avenue" extending approximately 1 mile in length between the Capitol Building and an equestrian statue of George Washington to be placed south of the White House (where the Washington Monument stands now). In 1901, Senator James McMillan of Michigan organized a committee of renowned architects, landscape designers, and artists to create a new plan for the Mall. The McMillan Plan expanded on the original city plan by L’Enfant and created the National Mall that we know today. The plan called for re-landscaping the Capitol Grounds, extending the Mall westward and southward to form West and East Potomac Park, selecting sites for the Lincoln Memorial and Jefferson Memorial and relocating the city railway (building Union Station), designing a municipal office complex in the triangle formed by Pennsylvania Avenue, 15th Street, and the National Mall (Federal Triangle). During the mid-1900s, The Mall became our nation’s premier site for public celebrations, civic gatherings, protests, and rallies. Famous events have included the 1963 March on Washington, the 1995 Million Man March 2007 Iraq War Protest, the annual Rolling Thunder, Presidential Inaugurations and many more. Throughout the century, the Smithsonian Institution built world-class museums (10 in total today) on the National Mall providing the public with access to collections that range from insects and meteorites to locomotives and spacecraft. National memorials were built throughout the century to honor the iconic figures who helped shape our nation. More than 25 million people visit the National Mall each year and a plan is needed to maintain the heart of the nation’s capital. In 2010, a new National Mall Plan was officially signed to revitalize and redesign facilities and infrastructure on the National Mall so it can continue to serve as a prominent stage for civic activities for future generations. The Trust for the National Mall was established to engage the public in creating a plan to meet the needs of the American people and support the National Park Service. Construction of the Capitol Building began in 1793. The Smithsonian Institution was established by Congress in 1847. Construction of the Washington Monument began in 1848 but was not completed until 1884. Union Station was built in 1907 as a part of the McMillan Plan, allowing the removal of unsightly train tracks on the Mall and eliminating the need for the Baltimore & Ohio Railroad terminal that was located at the current site of the National Gallery of Art. Cherry trees that were given to the nation by Japan were planted around the Tidal Basin in 1912. The Lincoln Memorial was dedicated in 1922. Advisory Council on Historic Preservation (ACHP) – The federal agency advises the President and Congress on national historic preservation policy. Commission of Fine Arts (CFA) – The commission, created in 1910, advises on design and aesthetics of architectural structures to preserve the dignity of the nation's capital. National Capital Planning Commission (NCPC) – The federal government’s planning agency, established in 1924, provides advice on projects that impact the nation's capital and surrounding areas. National Park Service/National Capital Region (NPS/NCR) Washington Metropolitan Region) As a bureau of the U.S. Department of the Interior, the National Park Service takes care of and provides services for America’s national parks.